28 ½ x 45 ¾ in. Trained by his English father as an engraver, John Kensett chose to become a painter. In 1840 he went to Europe for several years to study Old Master paintings and to develop his skills in London, Paris, and Rome. Upon his return to America, Kensett was recognized for his excellence in landscape painting and was elected to the National Academy of Design in New York. Kensett was also one of the founders of The Metropolitan Museum of Art in New York in 1870. This painting illustrates Kensett's switch from painting mountains and woodland interiors to coastal views. It also marks a change in his style to more contemplative painting known as Luminism, which focused on nuances of light and atmosphere, a method that may have been influenced by the new medium of photography. 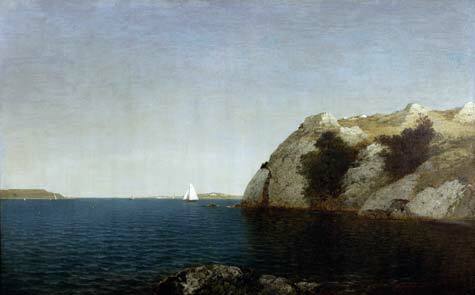 Kensett painted this favored panorama of Newport Harbor in Rhode Island several times. The viewer looks across Brenton Cove toward Beacon Rock on the right, and Fort Adams on the left in the distance. This painting is renowned for its indelible sense of calmness, clarity, and quiet, and occupies a central position in Kensett's oeuvre. Characteristic of his mature Luminist style, this work contains a sense of balance, spareness, and a rich evocation of hues.